In an aviation headset, Active Noise Reduction (ANR) is the greatest! Active Noise Reduction is a technique that uses a microphone in the earcup to pick up external noise. It then reverses the noise 180°, and plays it back through the earcup speaker, thus canceling out the external noise. All you hear is a slight hiss. I flew for years without them, telling myself I didn’t need to spend the $300 to get a new headset when my David Clarks work just fine. Then I borrowed a friend's set for a trip, and was sold. They don’t cut out every single sound. I can still hear my engine. It just isn’t so loud anymore. When I would fly cross country, doing six or more hours, I would land with a headache. After the ANR inserts, I no longer do. I was convinced I needed to switch to ANR, but I still couldn’t bring myself to throw away the DCs. So I found what I think is the perfect answer. I bought an insert kit that converts my DCs to ANR. That way I still get the comfort of the DCs and ANR to boot. And as an added bonus, it only costs $170. A minor expense when I thought about the possible damage to my ears, and the headaches I got. I bought mine from Headsets, Inc. Installation was very straight forward. I’m looking for help on this one. I’m trying to find a good quality ANR aviation headset that will fit my wife. So far, all the child size headsets we have seen are not the best quality. 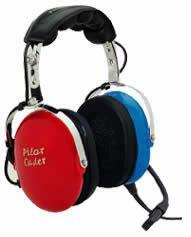 A few years ago we bought her the American Aviator Junior model WAPJR headset. It looks a lot like this one. I couldn’t even find it on the web, maybe they don’t make it anymore. She isn’t happy with it because it doesn’t fit well. We tried putting more padding on top to raise the earcups, but it was still uncomfortable. Has anyone had good or bad experiences with the smaller sized headsets? Preferably an ANR one?